Celebrating our multi-time World Champions and our Ultimate Axe Series with this latest Axe Army tank. 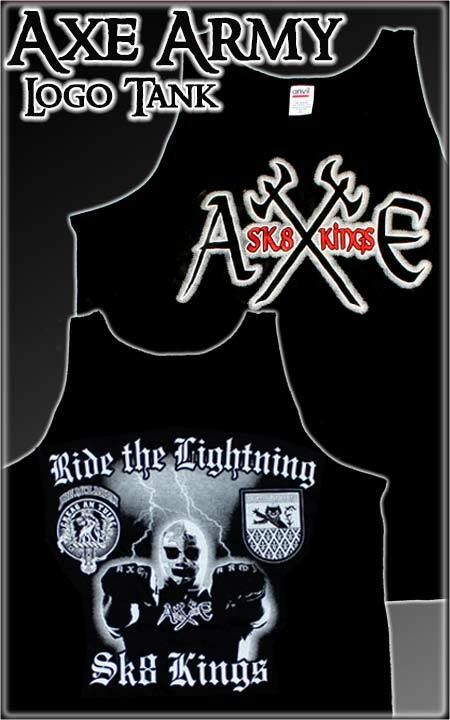 The Masked Man graphic is printed on the back of the tank - the OG Axe Graphic on the front. Get them while you can. Sizes and stock are limited. If you ride an AXE -- you're in the AXE Army. Even if you're not in the Army you're welcome to wear one anyway! High-quality 100% cotton Hanes or Gildan Tanks -- rich durable silk screen front and back. Available in standard adult sizes Large, X-Large and XXL. Limited to stock and sizes on hand. Extra Special Price when ordered with any AXE SERIES DECK OR COMPLETE -- See upgrade option on each deck or complete item and order at the same time to receive the special pricing. Size (S-XXL Depending on style). Choose the shirt or hat style under bundle option at checkout and specify your choice of logo and size for the second item in the "Notes" section.